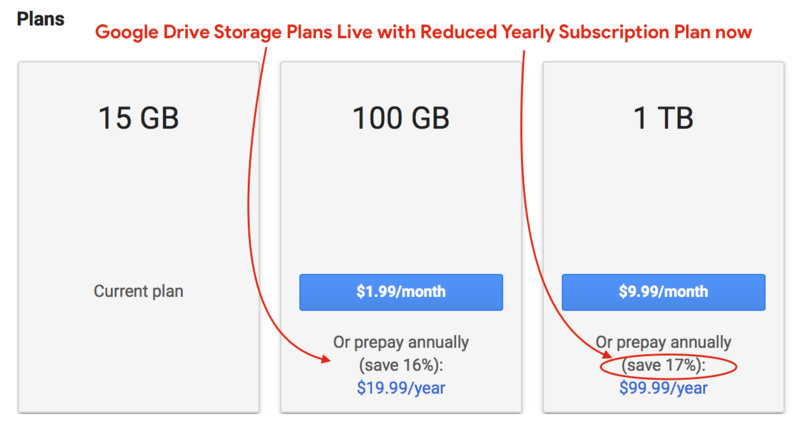 It’s been little late but Google finally has yearly subscription plan discount live for some users. Couple of weeks back Google Announce discounted price on their blog. I do have Google G Suite subscription for my Crunchify LLC and have my personal account @gmail.com. I just checked my Gmail storage option here: https://www.google.com/settings/storage and found that Discounts are live now. We could save now 17% of yearly subscription, that’s $99.99/year for 1TB space. Online Plan 2 subscription offers biggest discount which is $10 for 1 TB space for 5 users. In addition to that you could use Google Play store credit to buy Google Storage. Let me know if you see that option for you.